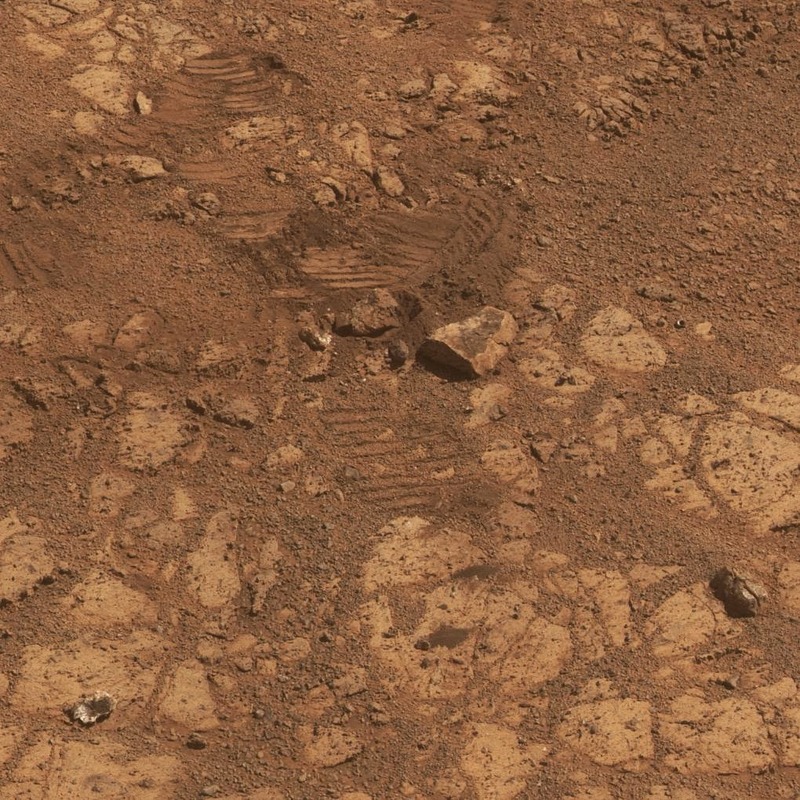 This image from the panoramic camera (Pancam) on NASA's Mars Exploration Rover Opportunity shows the location of a rock called "Pinnacle Island" had been before it appeared in front of the rover in early January 2014. This image was taken during the 3,567th Martian day, or sol, of Opportunity's work on Mars (February 4, 2014). Pinnacle Island, (see arrow in Figure 3 in the lower left corner of the scene), has a dark-red center and white rim, an appearance that has been likened to a jelly doughnut. It showed up in front of Opportunity in an image taken on Sol 3540 (January 8, 2014) at a location where the rock had been absent in an image taken four sols earlier. Researchers used the microscopic imager and alpha particle X-ray spectrometer on Opportunity's robotic arm to examine Pinnacle Island for several days in January. 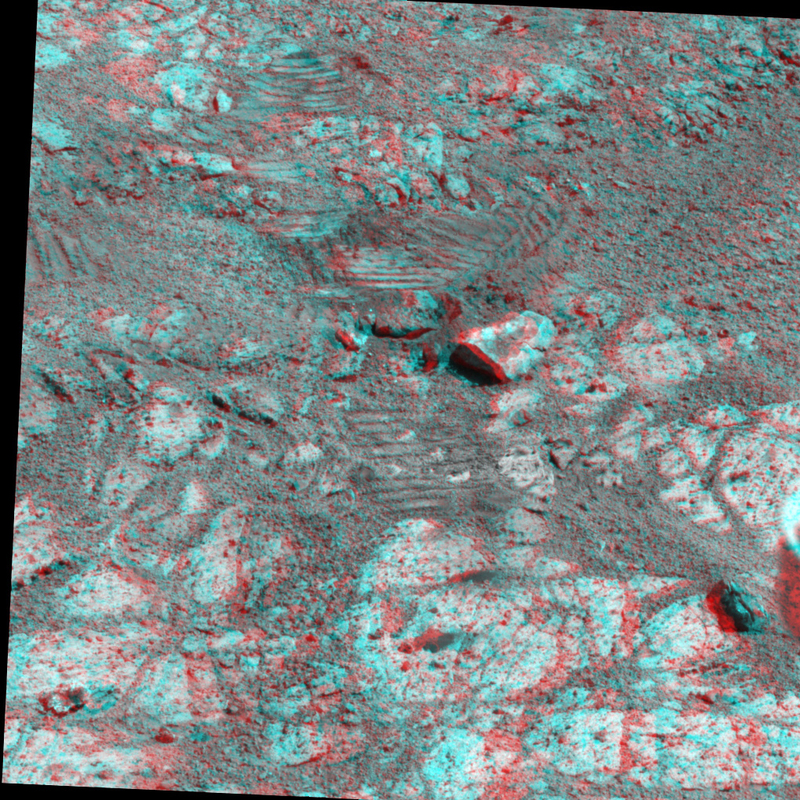 In this February image, a rock that has been dubbed "Stuart Island," with similar dark-red center and white edge, is visible just left the scene (see arrow in Figure 3 at near center). Its location is uphill from Pinnacle Island. The rover's own solar panels blocked a view of it while the robotic-arm instruments were studying Pinnacle Island. 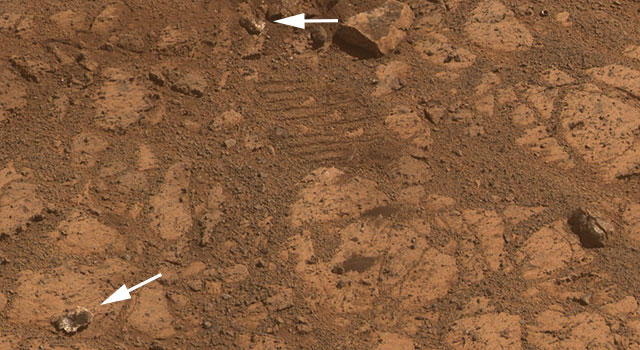 The wheel track beside Stuart Island helps tell the story: Opportunity drove over a rock and broke it open. One of the pieces, Pinnacle Island, was knocked downhill. For scale, Pinnacle Island is about 3 feet (1 meter) from Stuart Island. The view merges exposures taken through three of the Pancam's color filters and is presented in approximate true color. A version in false color, to emphasize subtle color differences among Martian surface materials, is available as Figure 1. A stereo version, Figure 2, appears three dimensional when viewed through red-blue glasses with the red lens on the left. Note: For more information, see Mars Rover Heads Uphill After Solving 'Doughnut' Riddle and Mars Rover Solves Doughnut Riddle.